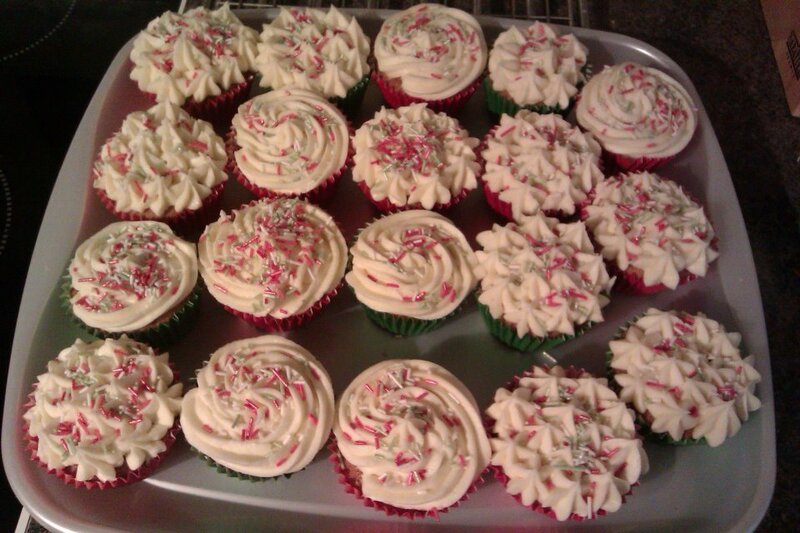 Back of Beyond Baking: Feeling festive! Here in the back of beyond Christmas seems to be very close and I am feeling slightly unorganised. I'm not really sure where the last three weeks have gone. I know I have been busy with work, and baking, and socialising, but last time I looked I'm sure it was December the 1st! 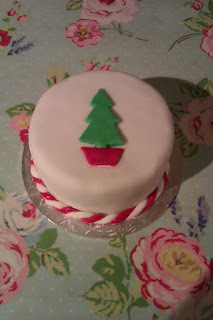 Out of the four Christmas cakes I made, this is the only one that is decorated and has been delivered to a fellow Christmas cake fan as his Christmas present. I am planning to marzipan the others this weekend and then ice them midweek. Last weekend we had the village Christmas party and Panto. This is a strictly village affair with everyone bringing a bottle and a plate of food to share. The Panto is the mastermind of our resident ex actor who writes and directs an enthusiastic bunch of amateur thespians in a traditional Pantomime with lots of in jokes about the village and it's residents. Considering the food is an ad hoc affair the spread is always impressive. 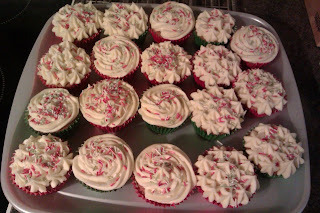 My "plate" was slightly more than a plates worth as I produced 24 Christmas themed cupcakes. I found red, white and green sprinkles in Morrison's along with green and red cake cases. Needless to say the cupcakes disappeared very quickly. On Monday night my son and I decided to make some gingerbread snowmen. My son has been going to cookery class after school and now fancies himself as something of a chef. He was very keen to complete this recipe all by himself, so with only a small amount of input from me he turned out a pretty impressive batch of gingerbread snow men and other Christmas related biscuits. The recipe came from the BBC good food website and was really easy to make with the use of a food processor. 1.Sift together the flour, bicarbonate of soda, ginger and cinnamon and pour into the bowl of a food processor. Add the butter and blend until the mix looks like breadcrumbs. Stir in the sugar. 2.Lightly beat the egg and golden syrup together, add to the food processor and pulse until the mixture clumps together. Tip the dough out, knead briefly until smooth, wrap in clingfilm and leave to chill in the fridge for 15 minutes. 3.Preheat the oven to 180C/350F/Gas 4. Line two baking trays with greaseproof paper. 4.Roll the dough out to a 0.5cm/¼in thickness on a lightly floured surface. 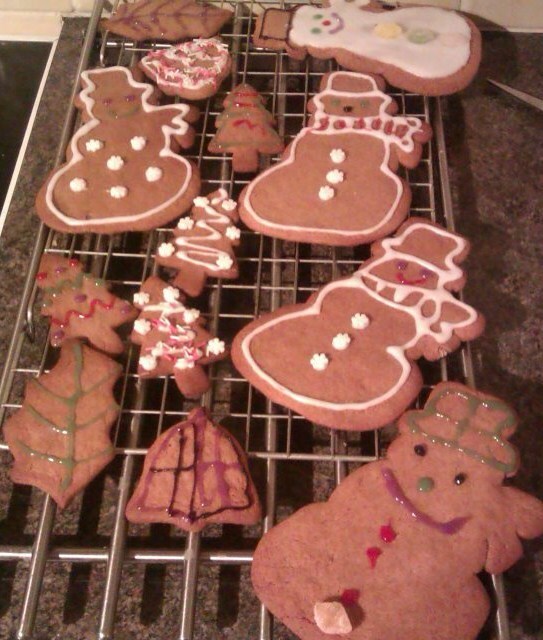 Using cutters, cut out the gingerbread men shapes and place on the baking tray, leaving a gap between them. For hanging as decorations, use a skewer to make a small hole in the top of each biscuit. 5.Bake for 12 minutes, or until lightly golden-brown. Leave on the tray for 10 minutes and then move to a wire rack to finish cooling. When cooled decorate with the writing icing and cake decorations. Yummy as always and well done to the Masterchef,Little Master VanderC!!! !